For those new to managing horses without metal shoes. Overview of nutrition requirements, movement and environment for successful hooves without shoes (and the role of using boots). Maintenance trim $50 per horse. Horses should be trimmed every 4-6 weeks. Boot Fitting Services Horses needing hoof protection during work or due to pathologies, Stacy will fit and sell you EasyCare Inc products. Easyboot Gloves and Easyboot Back Country boots are stocked and available at a fitting. 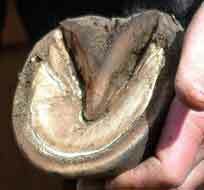 Rehabilitation assistance with thin hoof walls, quarter cracks, laminitis and founder. Stacy welcomes the opportunity to support you and your veterinarian with plans to keep your horse healthy & sound. Horses are expected to stand cooperatively for hoof trimming/grooming/veterinary procedures. Stacy will work with you and your horse to develop safe ground manners, or refer you to a trainer. Stacy has received training from and is an active member of the Pacific Hoof Care Practitioners.